« Bank Holiday Puzzler: what is this object? When I was about six, my Great-Aunt Eliza gave me this nautilus shell. It was kept on top of a high chest of drawers in the West Room – a big spare room with a four-poster bed so huge that it had to be sold with the house. 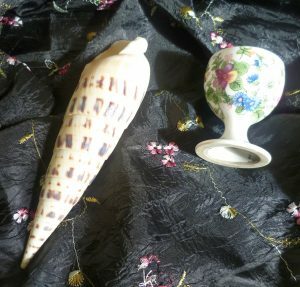 I wasn’t allowed to have the shell in my own bedroom until I was about eleven, so I only glimpsed it occasionally but the knowledge that it belonged to me always gave me a thrill. 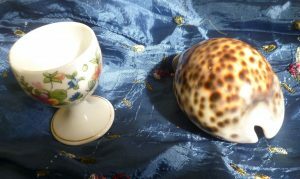 I naturally assumed that shells like it lay all over the ocean floor in pearly splendour. It only slowly dawned on me that that wasn’t true and that someone had carefully removed its crusty outer shell to reveal the mother of pearl within. 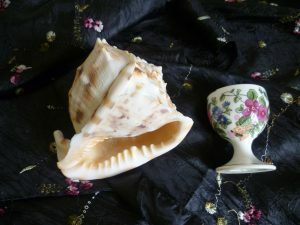 When I began to write this post, I had to google it to find out what it was – and nautilus is the nearest I could find. I know nothing else about it, like where it came from. Great-Aunt Eliza died a couple of months short of her hundredth birthday and she’d had had the shell as a child, so it must date back to the 19th century. 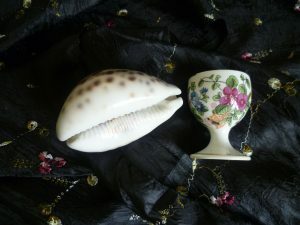 When I was a teenager, my mother gave me the shell below. She called it a leopard-spot cowrie, and that’s how I’ve always thought of it. But when I came to google it, leopard-spot cowries didn’t appear to exist, and it looks most like the photos of tiger cowries. I can quite see why my mother called it ‘leopard-spot’ because tigers are stripy not spotted, and this shell is definitely spotted. So there’s another small mystery here. 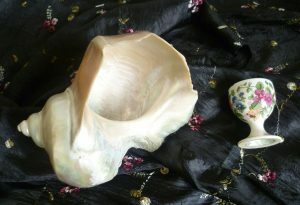 I’ve always thought of it as a sophisticated shell, one designed by a top French 1920s couturier, Coco Chanel, perhaps. 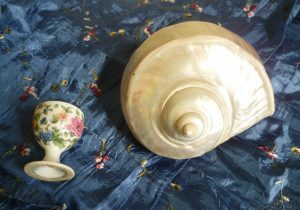 Once I was grown up and had a house of my own, I began to look for other shells. 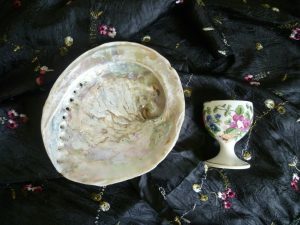 I bought the paua shell below to use as a soap holder. It has a row of convenient holes to allow the soapy water to drain away – you just tip it gently. In fact, this is my second paua shell. I cleaned the first one too energetically and it broke. So I’m now much more careful. My next shell is a helmet shell, see below. I bought it in Port Isaac, a fishing village on the north Cornish coast where my Aunt Peggy lived. I always made a bee-line for the fishing shop with its baskets of shells, fishing-floats, coils of rope, etc., whenever I visited. 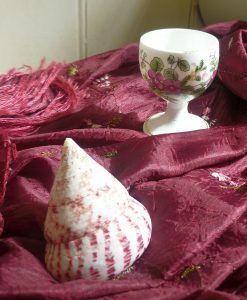 Incidentally, I’ve photographed all the shells next to a Victorian egg cup which is just over 2 inches (6 cms) tall, to give a sense of scale. Victorian eggs were obviously smaller than modern eggs – something I notice every time I have a boiled egg. My next shell (see below) is the fearsome-looking marlinspike which is surprisingly heavy. It fits snugly into one’s hand and it looks as though it could do a lot of damage. When I bought it, I was thinking about a possible novel set in 19th century Edinburgh. My heroine, Carolina, lives with her crusty Antiquarian great-uncle in one of the medieval flats in Gladstone’s Land just below the castle. There was to be plenty of skulduggery and something about a Jacobite rose bowl – I’ve forgotten exactly what – but the marlinspike struck me as being an excellent weapon of choice for Carolina when confronted by the villain who has (naturally) evil intensions on both the rose bowl and her virtue. So I bought one (as part of my research, of course) in the Port Isaac shell shop. 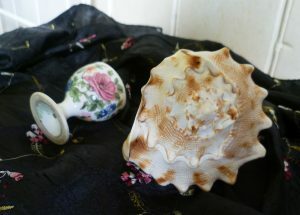 I acquired my next shell (see below) simply because I thought it was pretty and I liked the colour. I have no idea what it is. I knew what it was when I bought it, of course, but I stupidly forgot to write the name down and now I’ve forgotten. None of my shells cost very much – I like to have them around and enjoy them, not keep them locked away because they’re so valuable. 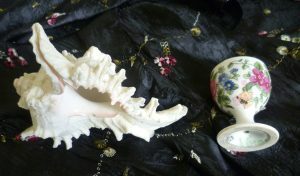 My last shell, see above, is a murex and it’s obviously an everyday murex. When I googled it, I could see at once from the hundreds of murex photos that mine was a very battered-by-the-waves example. But I liked the glimpse of pink, and it sits on a small shelf in the bathroom, with the leopard-spot cowrie and the helmet shell where I can see them. I’ve decided not to collect any more shells. It’s all too easy, as one grows older, to find that one’s house is full of stuff. I had a grand clear out a few years ago, said ‘Goodbye’ to a number of things which qualified as ‘stuff’, mentally thanked the donors, and took the objects to a charity shop. They would find new owners, the charity would benefit, and I’d have more space. I hoped. Since childhood shells have fascinated me. Now, my youngest granddaughter and I collect them from the beach when we go on holiday. Sometimes, I fill arrange flowers in a glass vase, tip shells into it and top the vase up with water. The combination is a talking point. What a lovely idea, to show off the beauty of the shells in a vase of water; I can see that it would bring out the colours wonderfully. Thank you for telling me about it, Rosemary. I’m going to try it with some very small shells my niece brought me from Martinique. A florist’s tip might help here: a few drops of a Sterilizing Liquid for babies (a very mild bleach) should stop the water from turning green. Gorgeous shells. I love shells too. Had a huge one that someone brought back from the West Indies for me, but I’ve just given it away (in the massive downsize of moving). I enjoyed it for a long time, so someone else is welcome now. I have two of the leopard spot ones, and also one with spikes coming out of it – no idea what that is. My absolute favourites were incredibly delicate shells I brought back from Kiribati (where I stayed with my father for 3 months when he was living there). I think they were crab or similar, but so thin and very very pale in colour that were like fairy stepping stones. I kept them in a box for years, but have no idea where they went in the end. The three I mentioned are on display along my library shelves. I also love the gorgeous pebbles you can find along the beaches and used to come back with several of those every time I went anywhere near a beach! Thank you, Elizabeth, for your comment. I love your depiction of the ‘fairy stepping-stones’. I agree with you about pebbles. I have a stone which looks like a lump of amber when it’s wet; and another which is grey with red stripes running through it, which also looks wonderful when wet. It’s strange how the simplest things can give one so much pleasure. I’m going to try Rosemary’s suggestion of putting shells in water to bring out the colour, and I’ll add the two pebbles as well. Thank you for reminding me that I have them! What a lovely post, and timely, too, when the summer has taken many of us to the seaside. Thank you, Elizabeth, I am familiar with most of the shells, but not with their names. Please write the Edinburgh book, and let Carolina defend her virtue and the rose bowl with the shell 🙂 I have an Edinburgh book in mind, too, but mine follows George IV’s visit in 1822. We could compare notes! Thank you for your comment, Melinda. I had a wonderful week in Edinburgh doing research for ‘The Jacobite Rose Bowl’ and then… well, life happened – as it does – and by the time I’d got back to normal, I realized that I couldn’t go on with the book. However, I kept my notes and the first couple of chapters, so, who knows? These things are never wasted. Do keep me up to date about your George IV’s visit to Edinburgh book.